A wonderful fall dish that will feed a crowd. I am sure you could make a half of the recipe easily. 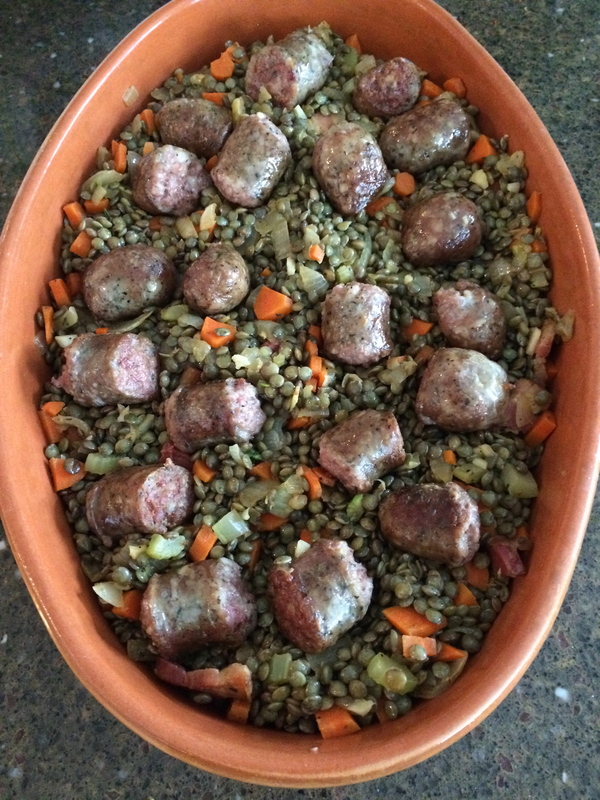 This recipe is adapted from David Tanis’s cassoulet in Bon Appetit. I found the french garlic sausage at my butcher. 1) You’ll want the liquid in which you cook the lentils to be highly flavorful. The dish is still good if you were to use water—and I offer tips about that in the body of the recipe—but it’s best to use a chicken or vegetable stock, sometimes doctored with a splash of white wine. 2) The quality of the sausage matters here, but the type of sausage, I’ve found, is flexible. The original recipe calls for the gorgeous French-style garlic saucisson or smoked kielbasa, but I can’t get my hands on those very frequently. I’ve used both smoke-cured and fresh sausages to equal success, browning the fresh sausage pieces before adding them to the dish. Just make sure to use a sausage whose flavor profile fits this garlicky, herbal dish: spicy Italian sausage or chorizo doesn’t work best here. 3) You’ll need to chop quite a bit to get the mirepoix (onions, carrots, celery) ready for this dish, which I know is daunting for some both in terms of time and in terms of having celery languishing in your crisper. I recently tried out making mirepoix in a big batch and freezing it ahead of time, and liked the results. 4) I frequently make this dish mostly ahead of time the night before a dinner party; then put the breadcrumbs on and bake the day-of. I’ve indicated where to stop in the recipe. Heat a heavy bottomed skillet over medium high heat. Add the bacon and cook, stirring occasionally, until it renders a bit of fat and begins to turn golden. Do not let the bacon brown too much or begin to crisp. Add the carrots, onions, and celery. Reduce the heat to medium low. Cook, stirring occasionally, until the onions start to become translucent and the vegetables are a tender but not mushy. This can take some time, up to 15 minutes. Season the vegetable mixture with salt, pepper, and cayenne. Add the garlic and fresh herbs and cook, stirring, one more minute. Remove from heat and set aside. Add the lentils and liquid to a large pot. If you are only using water as your liquid, season your water with some salt and a bay leaf, if you have one. Bring the lentils to a boil and then reduce to a simmer, cooking for 15-18 minutes, or until they are tender but not mushy. Drain the lentils, reserving their cooking liquid (it will have turned a bit murky but has that amazing peppery, pebbly lentil taste to it). Remove the bay leaf if you used it. Add the lentils to the bacon-vegetable mixture and stir to mix. Taste for seasoning and season with more salt and pepper if necessary (I find it’s generally necessary). Transfer the whole thing to a baking dish. Mix the breadcrumbs with the olive oil or melted butter. Season lightly with salt and pepper. Smooth the lentils in the baking dish and gently scatter the sausage pieces over the surface, pressing them in until they’re flush with the surface of the lentils. Pour the reserved cooking liquid into the baking dish until it just peeks above the top of the lentil mixture. (TO MAKE AHEAD: stop here, cover and refrigerate the lentils, and continue the next day with the breadcrumbs.) Scatter the breadcrumbs over the top evenly. Cover the dish with foil or a lid and bake in the preheated oven for about 30 minutes. Remove the foil and continue baking until the breadcrumb topping is dark golden, anywhere from an additional 10 to 20 minutes. 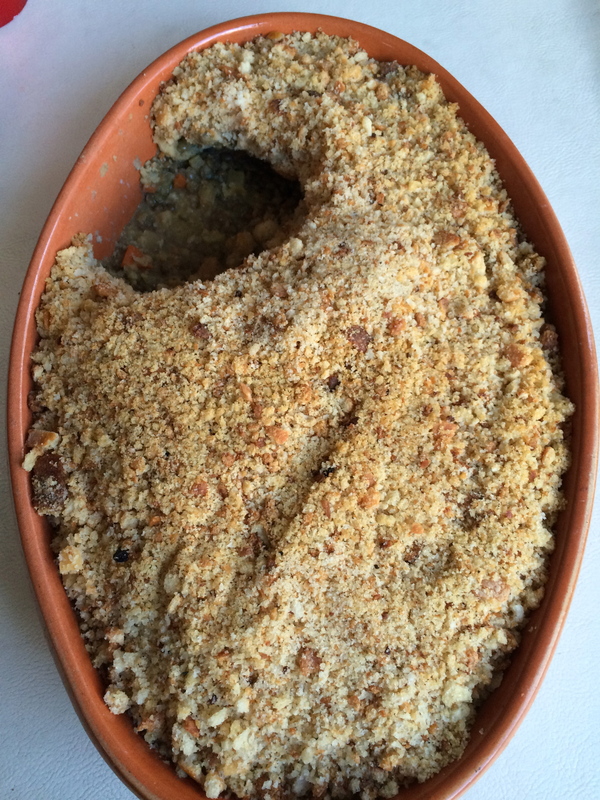 Allow the cassoulet to rest 15 minutes before serving, if possible. Serve with a salad of greens in a mustardy, tangy vinaigrette.